Throughout the summer months the large olive-coloured nymphs of the damselfly make up a large part of a stillwater trout’s diet. But while many stillwater trout anglers have used so-called Damselfly nymph patterns, few have used a true imitation. As the real damselfly nymph swims with a seductive wiggle of its abdomen, it is a good idea to incorporate a degree of movement in its imitation. 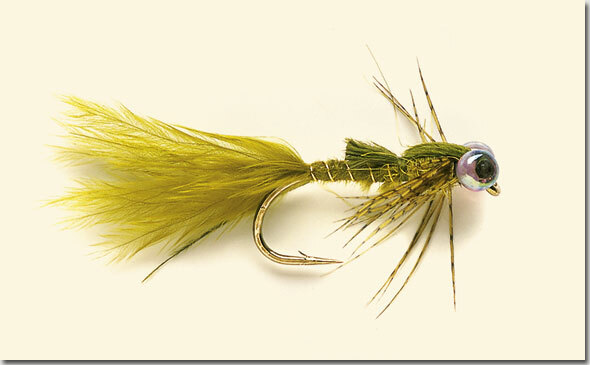 The easiest way is to use a tail of olive marabou tied reasonably long, so that it has a good action, but not so long that the pattern becomes more like an Olive Tadpole than a proper imitation. The reason that size is important is because when trout are feeding heavily on the real damselfly nymphs they can prove difficult to catch on oversized patterns. What is required is a fly that still has plenty of movement but is closer in size and colour to the real thing. This pattern employs a standard wet-fly hook and a marabou tail to create a fly little more than an inch long – which is roughly the size of the real nymph when fully mature. 1. Fix the hook in the vice and run on the tying thread just behind the eye. Form two eyes by fixing small glass beads on to strands of 20 lb nylon, which have been melted at one end. 2. Position the beads on top of the hook and fix in place by using tight turns of thread wound along the nylon monofilament strands. 3. 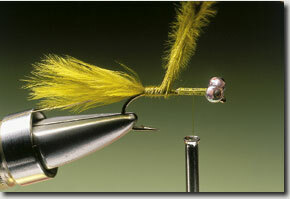 Once the eyes have been secured remove the excess nylon and carry the tying thread down the shank in close turns. 4. Take a small pinch of marabou fibres. Choose the ones that are most fluffy, which are found at the base of the plume. Catch them in at the bend to form the tail. 5. Secure the tail with tight thread turns then catch in, at its base, three inches of fine gold wire. 6. Take a second pinch of less-fluffy marabou fibres from close to the plume-tip. Catch them in by their points at the base of the tail. 7. Carry the thread back up the shank, stopping a short distance from the eyes. Take hold of the marabou and, allowing the fibres to spread flat, wind it up to the tying thread. 8. Secure the loose ends of the marabou with turns of thread and remove the excess. Wind the gold wire over the body in evenly spaced turns wound in the opposite spiral to the marabou. 9. 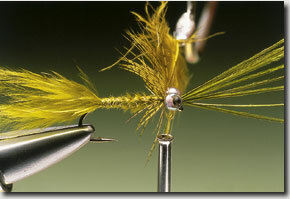 Remove the excess wire before catching in a bunch of dyed-olive pheasant tail fibres between the bead eyes. Allow the tips to project over the hook eye. 10. Catch a dyed-olive partridge hackle, by its tip, to the rear of the bead eyes. 11. Holding the hackle stem with hackle pliers, wind on two or three turns of the partridge feather. 12. Secure the stem of the hackle with the tying thread and remove the excess. Dub on a pinch of olive fur and wind back down the shank to form the thorax. 13. Stroke the hackle fibres down then pull the pheasant tail fibres over the back of the thorax. Secure with thread before casting off with a whip finish. Finally, trim the PT fibres to suggest wing buds. Damselflies are most numerous on rich lowland waters and it is here that imitation damselfly nymphs are most effective. The size of water doesn’t matter so long as there are extensive weed beds and shallows, which provide an ideal habitat for the naturals. Early summer from May into July is the time when damselfly nymphs transpose into the winged adults. It is then that they become most active, leaving the protection of weed beds and swimming in open water. When forming bead eyes, melt one end of the nylon then, after slipping on the first bead, add the second one. When the other end of the nylon is melted, and the second bead pushed into position, the ends of the nylon are sealed and neither bead can fall off.